A friend was given a pair of earrings by an aunt last Christmas. 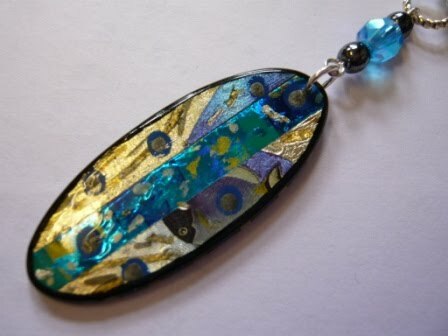 This lady usually gives lovely presents, often jewellery she has bought at craft fairs. Last year, the earrings had enormous dangles. My friend said they were like mini surfboards and they were much too big for her to wear. So she gave them to me to see if I could do anything with them. No problem ! 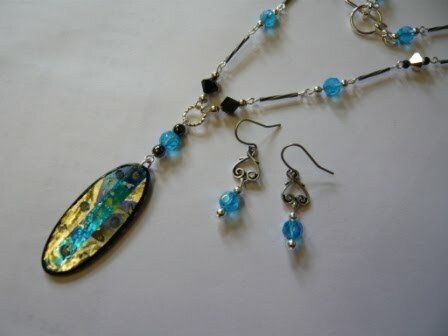 I used one of the dangles to make a nice pendant necklace, just adding some sparkly beads, and made a dainty pair of earrings to wear with it. I could see what she meant. They would have been enormous as earrings but made a lovely necklace. Detail of the surfboard pendant. Diane - the Swarovski beads made it look very pretty indeed. And I still have the second one to use yet. Must get my ideas in gear for that, or I could just make another one the same for myself.